A tiny, outdated kitchen gets a 21st century update—complete with extra storage, increased natural light, and more room to breathe. Read on for more of the story and photos of this beautiful before-and-after. 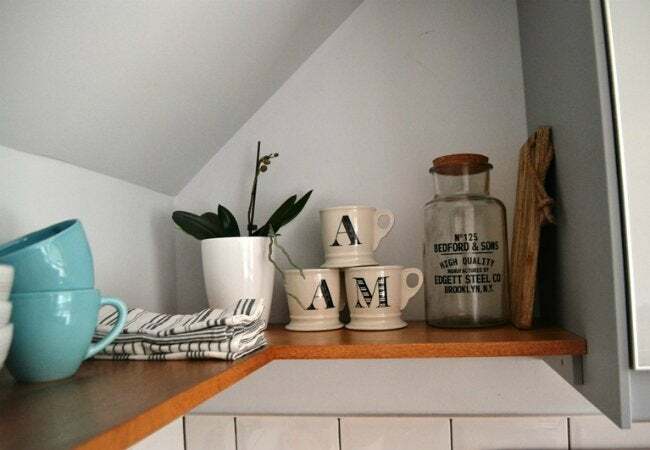 For Mat and Anna Nicholson, husband and wife with three houses’ worth of DIY renovation under their belts, a tiny kitchen in a not-so-dream home posed a creative challenge. First off, its tired style felt stuck in 1974. More concerning was its serious lack of space to cook, store supplies, eat in, and entertain. “The old layout left a lot of space underused,” Anna explained. “As it’s not a huge house, we wanted to make the most of what we had.” Together, she and Mat transformed the initially awkward room into a livable design by tearing down walls to open into a dining area, bricking over existing doors, and expanding windows into larger glass doors to invite in extra light. Floating shelves, a final addition, make even the most awkward corner useful and open up the tight space. Impressed by the work, we invited Anna to discuss behind-the-scenes details about designing her favorite project to date. 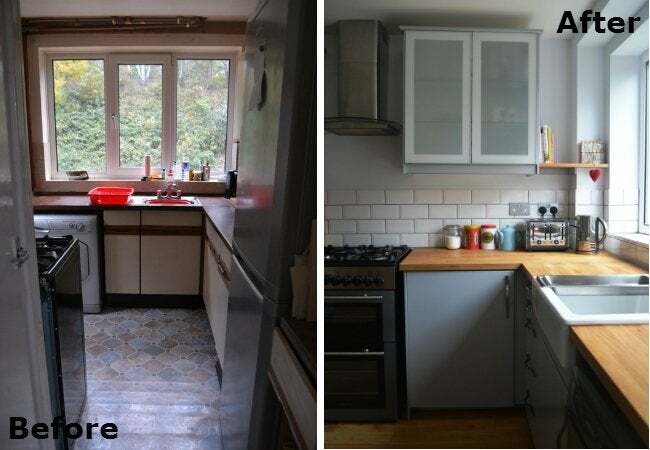 Read on for her experience of making the best of a tiny kitchen! How would you describe the kitchen before the makeover? The main problem was the size—the kitchen was very small. And the layout of the downstairs was old-fashioned, with one living/dining room going from the front to back of the house and a separate kitchen, complete with 1970s serving hatch. There was also a pantry in the kitchen that took up a lot of space, which we removed in the end, and a door that we bricked up for more wall space. What did you envision for this space? We wanted the room to feel light, bright, and open. The layout needed to fit in with modern family life—a dining kitchen, somewhere comfortable and pleasant to cook and spend time. You tore down walls, ripped out flooring, installed new cabinetry and subway tile—really, the finished space is barely recognizable! What was most challenging? 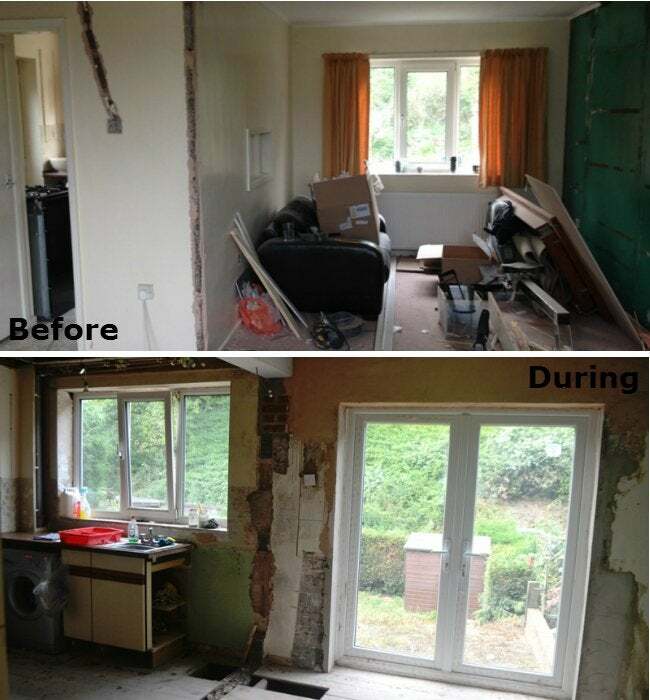 The biggest challenge was probably living without a proper kitchen for six months! As we did nearly all of the work ourselves alongside working full time, the process took longer. The biggest and scariest challenges were probably the structural changes—knocking down a wall and replacing a window with double doors—but they were worth it because they’ve made the biggest difference. Do you have any helpful advice for someone embarking on a kitchen remodel? Just make sure you get your measurements right and spend time thinking about and planning the layout of your cupboards and appliances. Which part of the new design are you most proud of? 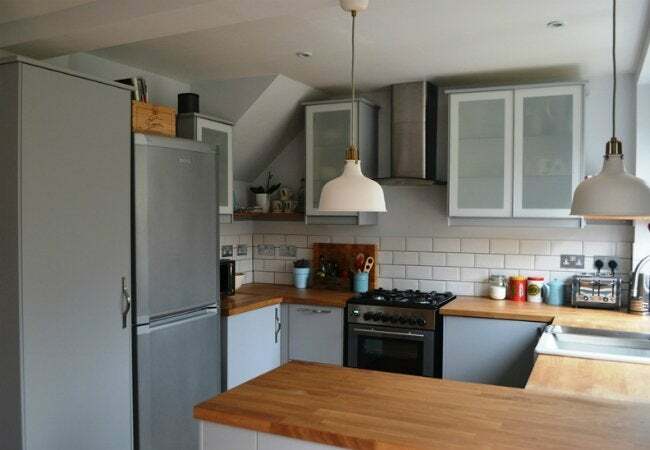 We just love the overall look, and the fact that we’ve managed to get all the appliances and cupboards we need in a relatively small space! How do you make the small kitchen feel more cozy and less cluttered? We’ve added open shelving in awkward corners, which I think looks great and serves a practical purpose—keeping the worktop free of clutter. Finally, how does this makeover change how you use the space? It’s a much bigger, brighter, and more sociable space. Now, cooking is enjoyable and it’s a room where we spend time after work preparing and eating food and chatting. Just after it was finished, we hosted a Christmas dinner for 10; seeing everyone sitting together in the room enjoying the meal was a really proud moment. The old kitchen could barely fit two people in at the same time! See more photos of the transformation at Angel in the North.